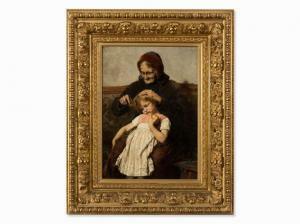 Find artworks, auction results, sale prices and pictures of Georgios Jakobides at auctions worldwide. 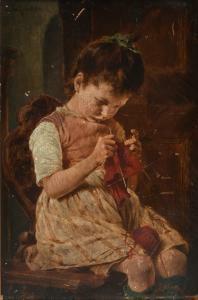 GEORG JAKOBIDES (Greece 1853-1932) A PAINTING, "Little Girl Knitting," oil on board, signed U/L "XXIV," verso inscribed. 10" x 7" Some mild scratches and losses, unusual texture, bubbling or craquelure at bottom right, some toning, but overall in fair to good condition, wear commensurate with age. Simpson Galleries strongly encourages in-person inspection of items by the bidder. Statements by Simpson Galleries regarding the condition of objects are for guidance only and should not be relied upon as statements of fact and do not constitute a representation, warranty, or assumption of liability by Simpson Galleries. All lots offered are sold "AS IS." Provenance: Theodor Stroefer Collection (1843–1927), Nuremberg; his heirs; Weinmüller auction, Munich, 15 July 1937, lot 35 (unsold); Weinmüller auction, Vienna, 15 December 1943, lot 748; Private Collection, Vienna. The painter Georgios Jakobides, born on the island of Lesbos, received his artistic training at the Academy of Athens. Thanks to a grant awarded to the young painter, from 1833 he was able to attend the Munich Academy, where he came into artistic contact with the school of Karl Piloty (1826–1886). His works captivated viewers with their academic naturalism, yet still possessed a great diversity in their colouring. 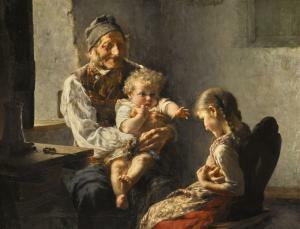 Jakobides garnered particular attention for his humorous depictions of children, which he used as an ever-returning motif until the death of his wife. In 1878, with fellow painter Toby Edward Rosenthal (1848–1917), he founded a school of painting which was open primarily to women, since access to the Academy was forbidden to them at this time. Prompted by his reputation, which extended far beyond Germany, the Kingdom of Greece commissioned him to set up and enlarge a state art collection. This collection still constitutes today the basis of the National Gallery in Athens. 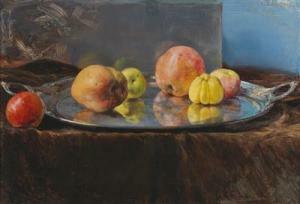 Jakobides\’\’\’\’\’\’\’\’s work captivates its viewers through its academically trained, realistic style, which enjoyed great popularity with the public in those years. He was not unbiased towards new artistic trends such as Impressionism, and not until later on can tendencies of modernism be detected in his work. 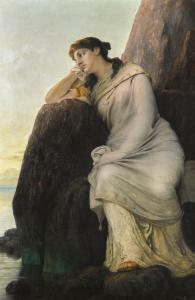 A reduced version of the painting \“Grandmother and grandchild\”, which is to be found in Museo Civico Revoltella, Galleria d'Arte Moderna, Triest. On the opinion of the expert Dr. Horst Ludwig this is an isochoric version of the painting from Triest.